Cricket Australia’s decision to rotate players to ensure that there is a good pool of players available at any time to mitigate problems arising out of injuries, players falling out on issues of when to sing the team song and when to pop a beer. The new rotation policy looks beyond mere player rotation and looks at rotating most things associated with Australian cricket to give itself a wider pool to choose from. Australian players to sport boxing gloves to give them the extra punch. It is also being speculated that there could be rotation policy for the selectors and spectators too. And also for retirements. Pat Cummins is expected to announce his one-day retirement first before Haddin retires from dancing down the wickets to quicks and Ponting from playing the hook shot. Written press releases are expected on these lines before Thursday from the players to show their commitment to this new initiative. 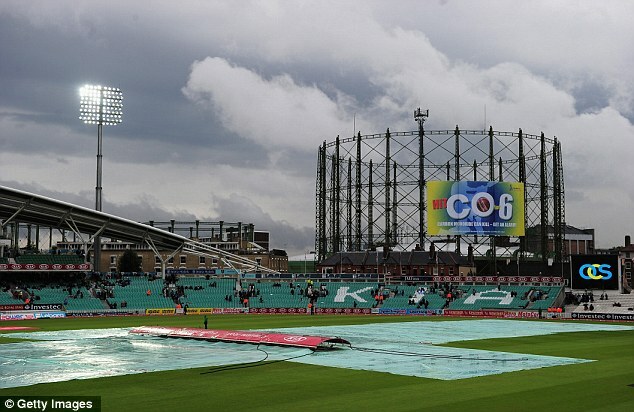 India scored over 500 runs in the first-innings at the Oval in their last two Tests here. Anil Kumble scored a Test hundred last time around! This time, however, Indian batting, has been a collective failure. In four Tests in 2007, not one top-order batsman got to a hundred though all but Dravid got close to it on multiple occasions. They were strong as a unit. 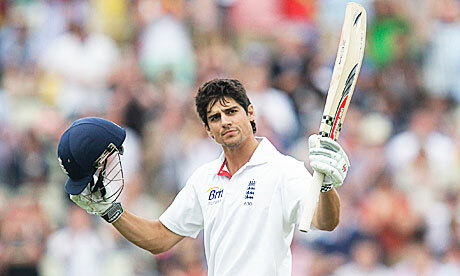 This time, barring Dravid, hardly any one else seems capable of wielding the willow. Still, it is hard to give up on this batting side. 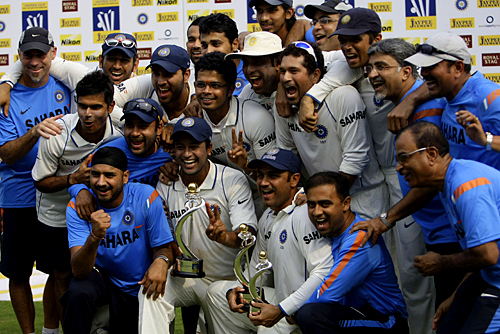 It is a far cry from the last time India were subjected to losing three Tests in a row – in Australia back in 1999-00. That was a team never expected to win and here is a team, which after three successive defeats, each progressively bigger than the previous one, there is still hope of a turn around. Only just. The break between the second Test and the third was expected to give them time to clear their thoughts as individuals and as a unit. Instead, they were handed a mauling by an impressive England unit with no apparent chinks. As the prospect of a whitewash looms large, India, with its perceivably wafer-thin bowling attack and a batting side equally thin on confidence, will need a remarkable turn around to stop England. They are a team of impressive individuals made of the right stuff. Things that have defined them over the last decade – resilience, doggedness, scrap – have gone missing. Big runs have eluded their batsmen. In fact, they have been deprived of any runs at all. It has left the players and the fans stumped. English bowlers have shown enormous precision in carrying out their plans. Their quick-bowling reserves seem to run deeper than the mental scars they have inflicted on Indian batsmen. Their lengths have been fuller, none more so than Broad, and they have managed to move the ball late both ways to make life suffocating for the Indians. It is in this cauldron of relentless pressure that India’s batsmen have been found wanting. Rahul Dravid has been the lone exception. 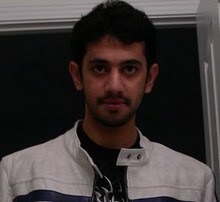 He has shown exceptional skill in handling the conditions and bowling. Tendulkar and Laxman have not been allowed to get away. The younger batsmen have been found out and must be wondering if they are good enough at this level. It will take enormous discipline, grit and patience to wear such a potent bowling side. You would have expected this Indian batting side to do just that for they are good at it. For starters, they would, for a change want the openers to grind and battle conditions. Sehwag has had his success overseas giving this first session to the bowlers. He can make for lost time better than most. Gambhir needs a score. That both are coming back from injuries hasn’t helped India’s cause. Tendulkar’s last average series came against a rampant Ajanta Mendis in Sri Lanka back in 2008. He looked unsure there like he has often done here. When he has been positive, like in the first innings at Lord’s, second innings at Trent Bridge and Edgbaston, he has hardly looked troubled. India will hope for a big innings from him and from another pillar of strength, Laxman, as it looks to pick up the pieces and put them back together. Expect Kohli, R.P. Singh and Pragyan Ojha to be given a look in. Ojha is a tidy bowler with potential. He should exploit any spin and bounce available and R.P. Singh is a steady swing bowler who might trouble the English openers. India will sweat on the fitness of Praveen Kumar and will hope that he is available. Ishant has blown hot and cold. May be, the bounce at the Oval will be to his liking. India needs big runs from the batsmen for its bowlers to pose a challenge to a rampant English top-order. It will be interesting to see their approach to this Test. One would think that holds the key to their success. It will be hard to put a smile on the face of an Indian fan these days. The tour to England, thus far, has exposed flaws that would, to an ardent fan, make even the disastrous regime of the Indian National Congress seem pardonable – a sign that usually announces the arrival of very hard times to come. As bowling strength dried up, and fielding slipped in to recession, a series provocative enough to the visitors appeared as scary to the Indian fan as the riots that have taken over the streets of England. In order to build credibility, henceforth, with an already skeptical public, a major reform in performance is what would have to be targeted. Sadly, the reform refers more to better cricket than anything else around. Against an attack that seemed to lack both ownership and leadership, talks over the struggling forms of the English openers were put to rest as Strauss and Cook relished the red delicacies that were thrown their way. The opening surge shed light into the mythic power of the English unit’s rapid rise to the top, ever since the advent of the Ashes triumph down under. Dhoni had acknowledged the prevailing skepticism by building accountability in to some of his causes for failure – injuries and workload. While the former was given a nod by some, the latter was rubbished. With Sreesanth struggling against southpaws, Praveen – intelligent and hardworking – but just not quick enough to trouble the batsmen, and Ishanth not consistent enough, Dhoni couldn’t but embody that popular Indian myth that with the lack of a departmental leader, the unit is virtually clueless. It simply wasn’t one of those days an Indian fan would want to remember: the bowling appeared to be fragile, and fielding slender – one really can’t do much but shrug when the man with a record catches in Test Cricket drops two sitters at slip. While the Indians seemed to fluctuate between the conundrums of lack of ideas and butterfingers, the English batsmen cashed in to take an insurmountable lead with the back-in-form Cook notching up his 19th ton, three away from topping the centurions chart among English batsmen. It is hard to believe that he isn’t 27 yet. It took a no ball from Mishra, revealed later through video replays, to get Strauss out sweeping to a delivery that he ideally wouldn’t have on another day. Bell, after being dropped by Dravid at first slip, fell to Praveen Kumar, who seemed the only Indian bowler capable of taking wickets. That Kevin Pietersen blazed past his half-century at almost run-a-ball, and at times striking at a higher rate, pretty much summed up the Indian attack’s lack of aggression, and ideas, on a day that surely has been the nadir of the series so far. The Indian woes just seemed to add up, like Amit Mishra’s no balls in test cricket. At present, the argument against the Indian bowling is obvious: the unit is as oblivious to the environment as the current Indian government is to scams and threats. The unit is deflating at the rate at which prices are inflating in their homeland. But at least with the current Indian cricketing setup, there is a little bit of hope that soon enough, the scenario will move the grey clouds away to witness a clear blue sky. Hope is the only energy source to which the Indian fan can cling on to.